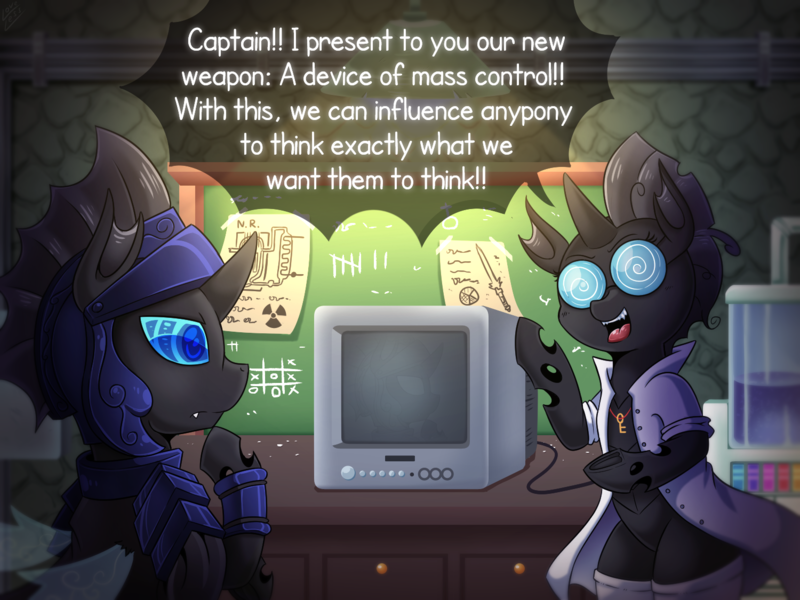 "What's a most dangerous mind control device we have here"
Nah the Internet is way worse than tv when it comes to controlling people. 1. Guard: I don't see the purpose of this, but okay, show me what it can do. 2. Guard: Why would we need this? We can just shapeshift and control everypony that way. Scientist: Great question! If we need this! Everypony will come to us willing with there love! Scientist: "Ahh! *covers up screen* Of course this device still has some bugs to work out!" It works best for making people think nothing at all. Sweet Celestia's Nutsack... They invented CNN! But her style with the container behind her makes it look like Alphys. Just one in a long series of mind control techniques. Meditation is a form of personal mind control, talking is a form of local mind control, newspaper and radio were doing it before TV, and today we have the internet and video games. Generally the later forms of mind control are more impulsively attention-stealing than the old forms, but long-form text-based techniques/technologies seem to have the opposite effect. They're still just as mind-controlling as other methods tho. how did they get holes in there wrist?